Activities: Sight seeing, Rafting, jungle safari, Trekking flight and panoramic views of Himalayas. After Breakfast, we drive to Charaudi 3 hours by private vehicles or by bus. Your rafting stats after your guide instruct you about the trip. Beautiful scenery, friendly rapids and warm water makes your rafting day exciting and memorable. . After 2 hours rafting, we make a lunch break and continue again and camp at Kurintar. After lunch you will drive in a private vehicle or public bus to the Royal Chitwan National Park. After breakfast, your adventure holiday starts off with canoeing in the Rapti River where you can see Gharial and then we visit to the Elephant breeding centre. After Lunch,we proceed to the jungle for a guided safari on Elephant where you are free to see animals such as rhino, antelope and other wildlife as you move through the jungle, After dinner see the Tharu culture Dance. After breakfast, we take a quick tour of Bird watching. Then we drive to Pokhara. 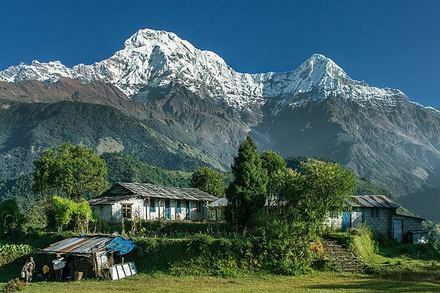 Pokhara is a place of remarkable natural beauty. The serenity of Phewa Lake and the magnificence of the Fishtail Peak rising behind it create an ambiance of peace and tranquility. Pokhara is a perfect place to see the panoramic view of Himalayan region including Annapurna and Dhaulagiri. One hour drive to Birethati from Pokhara (Alt. 1100 m) situated along the Modi River. People are very friendly and series of four water fall provide excellent swimming. The trail ascends to Tikhedunga. The flight from Pokhara to Kathmandu high in the Langtang & Annapurna Himalayas is one of the most exciting Flights. Some People experience the feeling of mountain flight. In just over half an hour, you get Nepal’s most popular largest Mountain View city, Pokhara. Flight to Pokhara gives an ample opportunity to view of Dhaulagiri and Annapurna Regions Mountains.